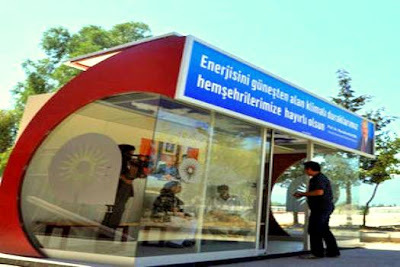 Antalya City is boasting of their latest creation: the first air-conditioned and solar-powered bus stop in Turkey. Antalya Metropolitan Municipality has produced air-conditioned bus stop which is producing their own electricity through solar panels and it has air-condition, touch door, 220-volt sockets. In these bus stops, you can charge your mobile phone, lap-top or iphone. The citizens enters through the a glazed touch door and the interior of the bus stop will be cool in summer and warm in the winter through air-conditioning unit. I think a lot of cities (especially Western cities) should follow this example. @ Claudia Del Balso, Thank you. We just want to create a livable city. @ Madeline, Yes. You should visit again..
@ cookingvarieties, Hi, thank you very much. Yes, this is really good for the citizens and tourists in Antalya. 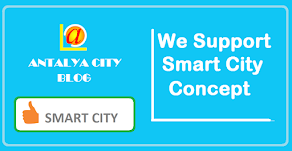 In addition to this, there are overpasses with escalator and lifts for disabled persons near these air-conditioned and solar-powered bus stops. Wow, this is a work of a genius! Two thumbs up. I hopw this would be used widely so that we would be able to save a huge amount of money. Thank you for sharing this information. @ Kaloy, you are welcome.. This is super cool! Maybe soon they could convert every Buss stop into a solar-powered stopover . That would make them save a huge amount of money in the long run. Hi, This seems to be an excellent idea. This is very nice that even bus stops now becomes Air conditioner. This is very nice concept.